Currencies are traded in pairs, each being a combination of three letters. The first currency is the “base currency” and the second the “quote currency”. The currency pair shows how much of the quote currency we need to purchase one unit of the base currency. Let’s use EURUSD as an example. The EUR is the base currency and the USD the quote currency. If EURUSD was trading at 1.1610, we would need to pay $1.1610 to buy 1€. CFD stands for Contract For Difference, which is an agreement between two parties where the difference between the opening and closing price of a contract is exchanged. When trading CFDs, you don’t own any financial instrument; your profit/loss depends on the price movement. Spread is the difference between the SELL and BUY price of a financial instrument, and it is calculated in pips. There are two categories of spreads: fixed and floating. Fixed spreads do not change according to the market conditions and time of the day, whereas floating spreads are highly dependent on these two aforementioned factors. The basic advantage of floating over fixed spreads is cost-effectiveness; traders get the best market price at any given time and do not have to pay insurance premiums as with fixed spreads. What spreads does Fondex offer? Fondex offers raw interbank spreads starting from 0.0 pips. Spreads on Fondex cTrader are floating for all instruments, with prices coming directly from top-tier liquidity providers. A pip is a unit that measures a financial instrument’s difference in price. For example, if the EURUSD opening price was 1.1310 and its closing price was 1.1325, there is a difference of 0.0015 or 15 pips. Since profits and losses from trading can refer to different currencies, pips help traders understand and communicate their profits/losses without the need of calculating each currency’s exchange rate every time. Which markets can I trade with Fondex? An order refers to the action of entering or exiting a trade. There are 2 types of orders: Market orders and Pending orders. A market order is an order to buy or sell an instrument at the current market price. An order is pending when it is not yet executed and hasn’t become a trade. Pending orders allow you to buy or sell instruments at a predefined price, and are executed when the market meets this price. Buy Limit: An order to open a long position at a price lower than the market price. You could place this order when you expect that the price of an instrument will increase after it has reached the limit price. Buy Stop: An order to open a long position at a price higher than the market price. If you expect that the price of an instrument will keep increasing after it has reached the stop price then you can place this order. Buy Stop Limit: An order to open a long position that is a combination of a stop order and a limit order. A stop-limit order functions as a stop order (i.e. placed above current market price) but with the benefit a limit order. This means you can set a limit for the price you are willing to accept. If the market moves outside the specified limit, the trade will be cancelled. Sell Limit: An order to open a short position at a price higher than the market price. You could place this order when you expect that the price of an instrument will drop after it has reached the limit price. Sell Stop: An order to open a short position at a price lower than the market price. You could place this order when you expect that the price of an instrument will keep decreasing after it has reached the stop price. Sell Stop Limit: An order to open a short position that is a combination of a stop order and a limit order. A stop-limit order functions as a stop order (i.e. placed below current market price) but with the benefit of a limit order. This means you can set a limit for the price you are willing to accept. If the market moves outside the specified limit, the trade will be cancelled. Stop Loss: An order used to manage risk and limit losses. Once you place a stop loss order, your position will be closed when the market price has reached the specified rate. Take profit: An order used to define your profit target and lock in your profits. Once you set a take profit order, your position will be closed once the market price has reached the specified rate. Launch Fondex cTrader Web at ct.fondex.com, and find the instrument that you wish to trade under the “Finder” tab. For example, let’s assume that you ‘d like to trade GBPUSD. At the Quick Links toolbar, at the top of your screen, before the “Layout “ tab. In the Symbol information window. At the top right corner of your positions window. Under the Symbols list, right-click on an instrument, and then click “Create new order”. Right-click inside the chart, and select “Create New Order”. Step 2. Place an order and open a position. Select “GBPUSD” from the “Symbols” list. Select the quantity you wish to trade in either lots, or GBP. You can switch between lots or GBP by using the cog icon at the right side of the “Forex” asset class. Click “Sell” if you believe the exchange rate of GBPUSD will go down, or “Buy” if you believe the exchange rate of GBPUSD will go up. You can also choose to set Stop Loss, Take Profit or Trailing Stop Loss levels for your order. When an order is placed, a position is created. A position means that you are exposed to a particular market and your profits or losses are highly dependent on the market fluctuations. How can I access my account history on Fondex cTrader? Your trading history can be accessed at any time via Fondex cTrader’s Tradewatch at the bottom of the platform. Apart from the history, you can view information on your open positions, orders, open and closed transactions etc. You can also download your trading history from Fondex cTrader by clicking on “Statement” at the top right on the Tradewatch. A lot is the amount of currency units you buy or sell. A standard lot equals to 100,000 currency units. You may also come across the terms mini and micro lots which equal to 10,000 and 1,000 currency units respectively. Can I trade mini or micro lots on Fondex cTrader? Yes, you can trade mini and micro lots on Forex, Energies & Metals. For Shares, Indices and ETFs, the minimum trade size is 1 lot. Leverage is the mechanism by which you can control a large amount of funds using a small deposit. For example, if your trading account has a 1:30 leverage, every 1 currency unit controls 30 units in the market. Assuming that you have $1000 in your account, 1:30 leverage would allow you to control a $30,000 position, magnifying your exposure and therefore the probability of profits or losses. What leverage does Fondex offer? According to the European Securities and Markets Authority (ESMA) regulation, which came into effect on the 1st August 2018 and has been renewed since then, Fondex will be offering to all accounts leverage of up to 1:30, depending on the asset class they choose to trade. A margin is a deposit required by a broker in order to keep clients’ positions open. A margin is usually expressed in percentage and equals the amount you wish to trade divided by the leverage. 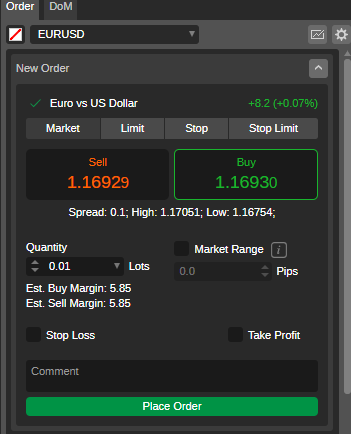 For example, if you are trading 100,000 currency units in EURUSD with 1:100 leverage, your required margin will be 1,000 currency units or 1%. A margin call may occur when a position you have is going against you and the trading account has not enough equity to support the open trades. If you receive a margin call, you may rectify the situation by either depositing additional funds or closing some of your positions. If you haven’t actioned upon the short equity in your account, your positions will be stopped out. Please note that according to the European Securities and Markets Authority (ESMA) regulation, which came into effect on the 1st August 2018 and has been renewed since then, the Stop Out level on all accounts is set to 50%. These measures are temporary and valid for 3 months unless renewed by ESMA. In order to prevent margin calls, you should regularly monitor your margin and adjust your positions accordingly. Do my open positions and placed orders close when I log off the Fondex cTrader platform? No, your positions remain open until you instruct the platform to close them by clicking the “Close Position” tab. Does Fondex charge overnight (swap) fees? Fondex charges overnight fees for customers who wish to hold positions overnight. Overnight charges do not apply to customers whose religion doesn’t allow them to pay or receive interest.